We all have places to go and people to see, as the saying goes. Sometimes we may also require a little help getting where we're going. Fortunately, taxi services can get us where we need to go. And, as with all human interactions and transactions, there are etiquette guidelines attached to the hiring and use of these services. When you hire a taxi or limousine to take you somewhere, you may need to wait before your ride arrives. 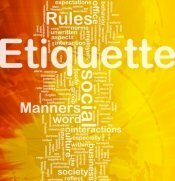 The etiquette needed at this point is a silent inter-weaving between established rules and regulations, and the implicit rules of courtesy, good manners, and a dash of The Golden Rule. If you need to be in line, make sure it’s the correct one. If you’ve been in a long line to catch a taxi to the airport, and that’s not where you are going, don’t expect the driver to ignore the rules. Be a kind person while waiting in line. If someone charges in front of you, avoid making a scene, even though this behavior is the height of annoyance. Just know that another cab will soon be there. 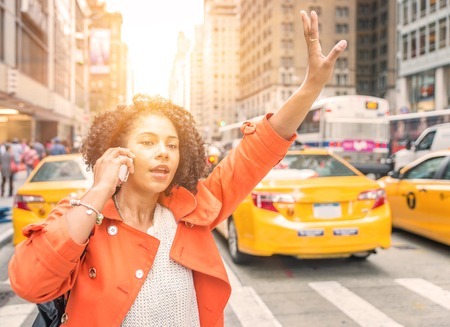 If you are hailing a taxi, do so in a recognized way - typically, holding your arm out and attempting to make eye contact with the driver as he gets close. Don’t engage others by jumping into traffic. If you need to use a credit card, verify that you can before getting into the taxi. Give clear instructions. Ask the cab driver to repeat the address. If your limo driver texts or calls you, respond right away. Verify your destination with the limo driver. Once You're on Your Way . . . Your driver knows where you're going, and you're relaxed in the back seat. The first part of the transaction is completed so all you have to do is sit back and enjoy the ride, right? Let's hope so. It’s okay to be friendly, but Chatty Cathys aren’t always appreciated. Outside the United States, friendliness is recognized in different ways. Be culturally savvy. If conditions in the taxi are not comfortable, it’s fine to kindly ask the driver to adjust the temperature, roll a window up or down, and yes, please turn down the music. Avoid eating food or drinking alcoholic beverages. And if you're partaking of any other beverage, be careful of spills. Respect the fact that you are in someone else's property. Don't leave any trash behind. Be sure to check for your belongings before exiting the vehicle. Always ask for a receipt with the driver’s name, even if you don’t need one. You never know when you may need to be in touch with someone regarding the ride. If you are paying cash for the taxi, have it in hand so you can exit the vehicle quickly. Adam Smith put it well: humans naturally “truck, barter and exchange.” It's what drives bi-lateral exchange between buyers and sellers. My economist husband always says that markets are about mutual giving and receiving. The mutual satisfaction of customer and seller come automatically in the often wordless exchange of currency. This brings us to tipping. Your tip is the market signal to the taxi driver that the service was appreciated. It is also a social signal of a true thank-you. Tips for taxi services are typically 15-20%, depending on your satisfaction. If the service was awful, and the driver drove like a maniac or made you feel unsafe, then not tipping is appropriate. Limousine services often include the gratuity in the fee. Be sure to check. There is no rule that you may not tip more, but it is not expected. It’s true, you don’t need to thank the cab driver or your limo driver to make the transaction work. Yet a thank-you and a "you’re welcome" importantly reinforce the gratitude of the exchange. As with any transaction, there is room for dissatisfaction. This is especially true when your safety is in the hands of someone else. If you enter a cab and allegedly the meter is broken, get out before proceeding. If you know you’ve gone extra distance, and your driver has not explained the route, you can choose to report the incident to his company or mention that you are going to unless the fare is reduced. Have cash with you in case you aren't comfortable using your credit card. If you feel unsafe, be observant for a good place to ask the driver pull over. You’ll want to be able to get new transportation quickly. Avoid showing ill feelings or using poor language, even if you are upset. Nothing is to be gained. A clear head will help the situation end in a more satisfactory manner. "Please" and "thank you" have their place here, too. During all human interactions, the primary etiquette rule when using taxi services is to always default to kindness. This will make the ride smoother every time!